When you order a meal in a restaurant, you expect a wait of 15 to 20 minutes. When I began a serious weight-loss plan, I knew I would have to work the same kind of turn-around time into my meal preparation or I would not stick to my new eating habits. I worked on my system over many weekends when I had time to try different setups. I loved eating at restaurants where I could see the chef cooking and observed that when an order for a dish came in, the ingredients he or she needed were already prepped and ready to go. In a similar way, I reorganized my refrigerator so that I could look inside, get inspired for what I wanted to cook and whip up a delicious, nutritious meal in just 15 minutes. This simple system has helped me lose 125 pound and continue to prepare fast, delicious and healthy meals. Top shelf: Soy milk is to one side. 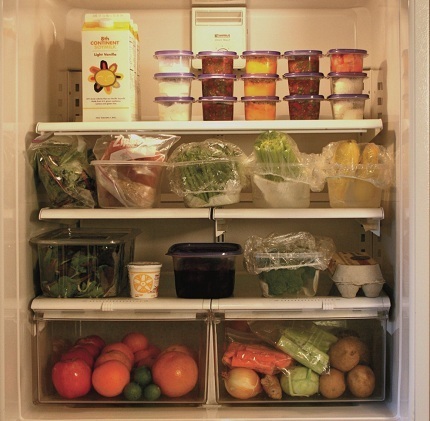 The back is stacked with one cup containers filled with premeasured, ready-to-go snacks and side dishes. You'll find one-half-cup portions of nonfat cottage cheese, one-cup portions of nonfat yogurt, butternut squash, salsa, etc. On the top shelf there is also a four-ounce package of meat thawing until ready to use. The next two shelves: Vegetables are the mainstay of my diet, so the contents of the next two shelves contain the backbone of my eating program. Several rectangular plastic containers, all the same size, are lined with a paper towel (towels absorb excess moisture to prolong the shelf life of produce) and filled with various vegetables. Some that you'll find in my fridge today are celery, green beans, mushrooms, peppers and Brussels sprouts. Each container has a plastic shower-cap-type lid, which you can buy in most supermarkets. The next shelf down holds mixed spring greens that I buy every week for my daily green salad. Two bottom drawers: Here I keep the fruits and vegetables I use in smaller amounts, such as onions, sweet potatoes and carrots. Fridge door: You will find nonfat Miracle Whip, dressings, grated hard cheese, Smart Balance Light spread, and nonfat cream cheese. All I have to do when I want to fix a meal is open the refrigerator door, select the meats and vegetables, and prepare them. Taking time to design a system that works for you will allow you to produce a healthful meal faster (and cheaper) than patronizing either a fast-food outlet or restaurant. Dian Thomas’s Idea Pack Library: You will never run out of ideas when you have this wonderful set of books. Check out Dian Thomas’ Creative Books Library Special. She now had a special offer to save 60% on 5 books and 1 DVD. Get Dian’s creative library for only $40.00. Save $60 dollar and have over 25 years of her creative and amazing ideas. This package will be great for gifts, for fun, and for kids and grandchildren. Take advantage of this limited offer at www.DianThomas.com.